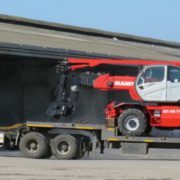 Conventional mobile cranes have to be operated by the driver from the crane’s cab. But what happens when you need to reach a place that’s not in view of the cab? 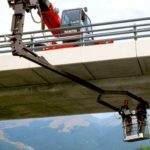 For instance, when working under a bridge or very high up where fine movements are required. 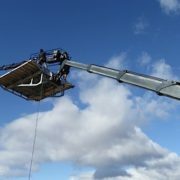 The answer is the remote-controlled telehandler. 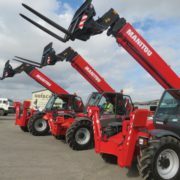 Our Manitou and Magni telehandlers (teleporters) can be operated from a personnel cage at the end of the boom using a radio-control set. 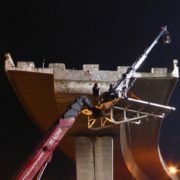 The video below shows us using a MAGNI RTH 5/30 with extendable man-cage and crane. The crane is for lifting material into the cage. Notice how the operator controls the boom and cage from the cage itself. There is nobody in the cab while this is happening! 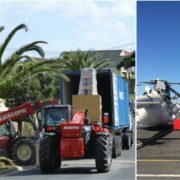 The remote-control capacity of our telehandlers means you get great precision of operation and can reach places conventional mobile cranes simply can’t. 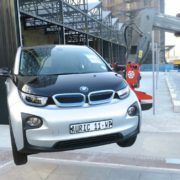 They are ideal for work on advertising billboards, bridge maintenance, movie sets and any place you need lifting power combined with fine control. 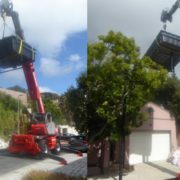 Call us with your lifting or access challenge and we’ll put our telehandlers to work. 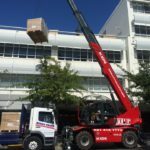 Liftup Teleporter – mobile crane hire in Cape Town and surrounds.